FREEPORT, MAINE — Don’t “Shop ‘til You Drop” in Freeport. Save some energy for two other “S” words: “serene solitude,” located less than five miles away at Wolfe’s Neck Woods State Park. This peaceful park with its ample green and white signage is easy to find via Freeport’s Bow Street and Wolfe Neck Road. Hutchinson said that the park, open from 9 a.m. to sunset, is noted for its active environmental programs. “Every day at 2 p.m., from Memorial Day until Labor Day, we offer a 45-minute guided nature walk, and tailor walks for the different age groups,” he said. In 1969, Mr. and Mrs. Lawrence M. C. Smith of Freeport gave 233 acres to the state to be dedicated to nature appreciation. In addition to guided walks, interpretive panels have been installed along park trails. Bike racks await bikers to the Freeport park, since biking is not allowed on its various foot trails. Park goers can call ahead (207-865-4465) to secure the covered pavilion that seats about 60 people and is handicap accessible near White Pines Trail. This area also offers a grassy field for playing Frisbee. Flush toilets and drinking fountains are located near the pavilion. Hutchinson said that visitors can bring gas grills, although numerous other grills for charcoal fires are nestled with picnic tables throughout the park. 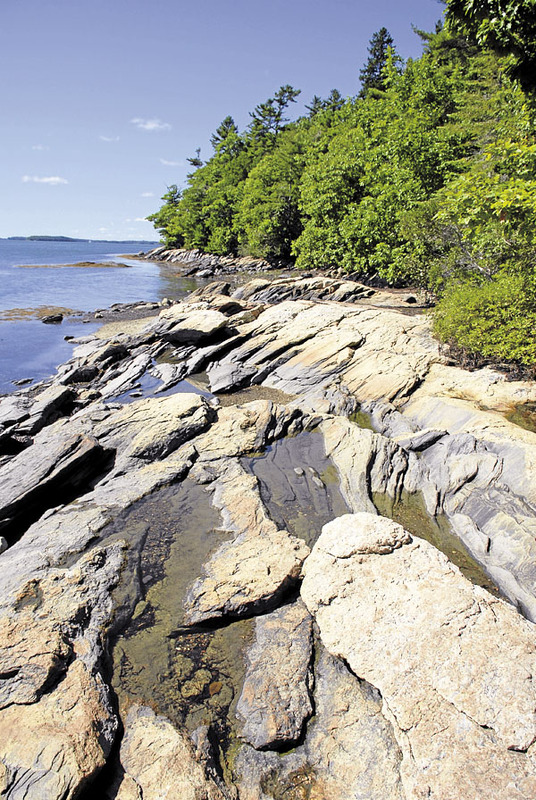 Wolfe’s Neck, bounded by the Harraseeket River and Casco Bay, features various ecosystems with trails named: Wood Road; Shore & Casco Bay; Pine Grove; and Hemlock, along with a marsh and small bog. The cost? For Maine residents, it’s $3; non-Maine residents, $4.50; residents over age 65, free; non-Maine residents over age 65, $1.50; children between the ages of 5 to 11, $1; and children under age 5, free. “What we don’t have is a sandy beach or lifeguards, so we don’t encourage swimming here,” Hutchinson stated, adding that those looking to play in the sand and swim in the waves “would be better off visiting Crescent Beach State Park,” located about eight miles south of Portland on Route 77 in Cape Elizabeth. Opened in 1966 on 335 acres, Crescent Beach State Park features a mile-long crescent-shaped beach for strolling, swimming, sunbathing and boogie boarding. “Our relatively warm ocean water and light surf make it an ideal spot for these activities,” he stated. Open from Memorial Day weekend through Columbus Day, the state park’s amenities include picnic tables and grills right near the beach, a children’s playground, a snack bar, a renovated bathhouse with bathrooms, changing stalls and rinsing showers; and a group site, complete with 15 picnic tables, available by reservation (207-799-5871). The beach and dunes provide nesting areas for the endangered piping plovers, and colorful beach roses provide a pretty backdrop on the trails for walking and observing nature. In the wet areas behind the dunes, birdwatchers can sight night and great blue herons and snowy egrets, Polackwich said. During its open season, pets are not allowed on the beach and must be on four-foot leashes at all times in the park. Crescent Beach fees are: Maine residents, $4.50; Maine residents, age 65 and over, free; non-Maine residents, $6.50; non-Maine residents, age 65 and over, $2; and children, age 5-11, $1. Those heading further south in Maine ought to stop at Ferry Beach State Park off Route 9 on Bay View Road in Saco — not to be confused with Ferry Beach on Prouts Neck Peninsula in Scarborough. Ferry Beach in Saco is open from 9 a.m. to 7 p.m., from April 20 until the end of October. Dogs can be walked on leashes on the trails but are not allowed on the beach, Crocker said. Crocker said park users can call ahead to reserve the shelter (207-283-0067), which seats about 50 people. The approximately 100-acre park offers picnic tables, benches, bathrooms, a changing room, water fountains, nature trails and “with funding for a new educational nature center in the works,” Crocker commented. Ferry Beach State Park fees are Maine residents, $4; Maine residents, age 65 and over, free; non-Maine residents, $6; non-Maine residents, age 65 and over, $2; and children, age 5-12, $1.